The key thing to focus on, however, is how a softening economy might not dampen your own green products sales. In some cases, it just might help. For instance, according to The New York Times, business is booming for reusable plastic water bottles that make it easy for consumers to use tap instead of bottled water. Information Resources reports that sales of water filters increased 16% in the first half of the year; I believe they should continue to run strong given their association with health; similarly, other products perceived as healthful, e.g., organics, should hold up as well. If you are a green marketer and sell your organic food products on the basis of taste, you may want to use this opportunity to shine a stronger spotlight on your brand's health preventive advantages. 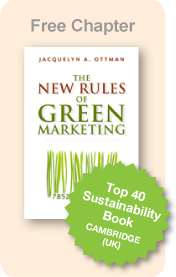 Make money in this downturn by using green marketing to show consumers how they can save money. The press is awash in articles about how consumers are flocking to Goodwill, and Wal-Mart's stock is one of the few blue chips that are up this year, as is that of Campbell's and General Mills. As reported in Business Week, since Wall Street imploded earlier this month, Freecycle.org has been registering 50,000 members per week, up from 25,000, and Freecycle and Freegans (a.k.a. "Dumpster Divers") are among the fastest growing groups on Yahoo! Even green marketers within the downtrodden financial services industry are finding creative ways to make green from green. According to Mintel, PNC Bank now offers a home equity line of credit for those making green home improvements, and the U.S. Federal Credit Union sells auto loans with lower rates for customers with an eye on high-mileage vehicles. Green marketing strategies like these can help your business weather today's storm while positioning yourself for growth in sunnier days.